Andy Katherman interviews noted Austrian Economist Dr. Robert Murphy, who exposes the fallacious reasoning behind a body of knowledge that is unfortunately gaining traction in academia and government called, Modern Monetary Theory. What is Modern Monetary Theory and what does it have to say about economics? Is it correct? Is it a complete crank macro-economic theory? Where does it fall flat? 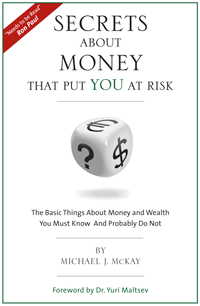 The focus of the interview is the book Seven Deadly Innocent Frauds of Economic Policy written by one of the chief proponents of Modern Monetary Theory, Mr. Warren Mosler. We at RadioFreeMarket.com do not consider this to be a serious book; quite the contrary, we view it as being quite shallow. Our concern is that this is being taken seriously by government policy makers who are using it to justify their ever expanding actions and aspirations. Government does NOT need to tax or borrow, it can just print the money it needs. Government deficits are NOT leaving our debt burden to our children. Government deficits DO NOT take away savings. Social Security is NOT broken. Savings are NOT needed to provide the funds for investment. It is GOOD that higher deficits today mean higher taxes tomorrow. Mr. Mosler attempts to convince us that Modern Monetary Theory makes all these concerns irrelevant. In other words, we don’t really have to worry about what government does! Dr. Murphy exposes the fallacious reasoning, slight-of-hand semantics, tautologies, and other tricks employed by Mosler. Please listen to this important interview because these tricks of reasoning used by Mosler are employed every day against us by the press, politicians and even well meaning friends and family. With Dr. Murphy’s sound presentation you can quickly be able to identify these tricks of reasoning and therefore insulate yourself from their influence. After listening to this interview, the next time a Rabbit Is Pulled Out Of A Hat you will a) see the trick being attempted on you, and b) not be fooled by it even if it comes at you from a slightly different angle of approach. Please share this interview with all those you care about (60 minutes). This entry was posted in Archived Show, Austrian Economics, Book Reviews. Bookmark the permalink. The inflation argument is nil. It’s supply & demand. Each year 2 million new participants are added to the US economy. So “printing” is eaten up by the continuous addition of new participants to the economy. The inflation argument is nil. Each year 2 million new participants are added to the u.s. economy. Those 2 million participants are out there looking for one thing to survive.. Cash. They either take that cash from existing supply (reducing wealth somewhere else in the pool), or they earn that printed money, eating up the “over supply” and keep inflation “in check”. I’m sorry but I found this interview very disappointing. Instead of “exposing the fallacious reasoning” it seemed like the response to each Mosler fraud is “Its true but kind of misleading”. What is really misleading is your statement above that Mosler attempts to convince us that “we don’t really have to worry about what government does” when clearly this is not the case. What Mosler is really telling us is that we need to worry about the right things and “the country is broke” or “the Federal government is going to default” are not the right things.